It’s been two years since we tried Killer Juice Cabernet Sauvignon, and the 2006 vintage of this boxed Cab is a more than worthy successor. The nose was mild, with ripe berry and woody notes. This Cab had a big, rounded cherry flavor with oak and black pepper in the finish. Crisp tannins contributed to a nice balance overall. 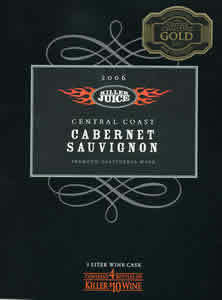 At the 2008 Twin Cities Food and Wine Experience, Killer Juice Cabernet Sauvignon 2006 took the “Best Value Cabernet Sauvignon” award. That may be a bigger accomplishment that it might seem to be at first glance – the other varietal winners of value awards were all bottled wines. I’m sure the Killer Juice makers were very pleased by this result. This wine hasn’t received a lot of blog attention, but How I Eat gave it high marks for everyday drinkability. The Wineauxs declared the 2005 vintage “simple and inoffensive – great for burgers and pizza.” We go along with these reviews – if you are looking for a very drinkable boxed red wine that you can put on your counter and enjoy every day, Killer Juice Cabernet Sauvignon 2006 is a fine choice. This entry was posted in Box Wines, Cabernet Sauvignon, Red Wines, Wine Reviews on July 17, 2008 by Roger. I had this last Christmas and managed to go through the box fairly quickly. Tasty stuff, though it is much better when you are drinking it with food. I’ve tried Killer Juice in earlier vintage and I think this one is the best so far. It’s still got good fruit but the 06 is dryer and more food friendly. I still don’t like the spout as it tend to drip a drop if you don’t tap it with your finger. It’s always nice when an affordable wine get’s better. The 2006 is a really nice everyday wine for a good price. how do I buy over the internet? Susan, you don’t see much boxed wine being sold on the Web both because of the tangle of state laws on shipping wine and, likely a bigger factor, because adding shipping costs reduces the value proposition offered by box wines. I’d definitely like to see some of the higher-end boxes in Web stores – there are a few brands I’m anxious to try but haven’t found locally or in my travels. Just got my first box here in Corpus Christi, Texas. I think this one will go fast. I am new to Killer Juice, but will be trying their other wines. I like the peppery light finish.